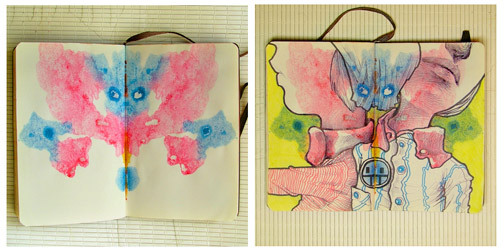 Artist L Filipe dos Santos has a nice sketchbook series called See Saw. They start with colorful gouache blotches and are transformed into quirky, story filled drawings. There is something really nice about allowing yourself to be inspired by color and shape. (Found through Sub-Studio).